f.42' Map of the action of Goodar Pass. Sketch of the ground at Kotra on which the action took place on the 1st Decr, 1840.
bl.uk > Online Gallery Home	> Online exhibitions	> Asia, Pacific and Africa Collections	> f.42' Map of the action of Goodar Pass. Sketch of the ground at Kotra on which the action took place on the 1st Decr, 1840. Pen and wash map of 'the action of Goodar Pass' by George Boyd (1800-1850) dated to circa 1840. This is one of 95 drawings (90 folios), chiefly of landscapes and monuments in the Deccan, West India and Afghanistan made between 1820 and 1844. Boyd served in the Bombay Infantry from 1820 to 1850 and was mainly employed in survey work. From 1822 to 1831 he was in the Deccan and Satara; in 1835 he was on survey in Kathiawar; and in 1839 he was making road surveys in Sind. He was mentioned in dispatches during the war in Afghanistan in 1840 and in 1842 he worked on a survey between Quetta and Kalat. In the 19th century the British, eager to defend their Indian Empire from Russian territorial ambitions, were involved in campaigns in Afghanistan and the North West Frontier Province (Pakistan). 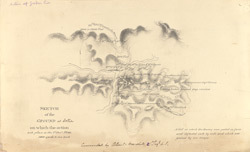 This map was drawn at the time of the First Anglo-Afghan war of 1839-42 and includes notes about positions of the troops commanded by Colonel Marshall, 25th Regt. N.I. on December 1st 1840.